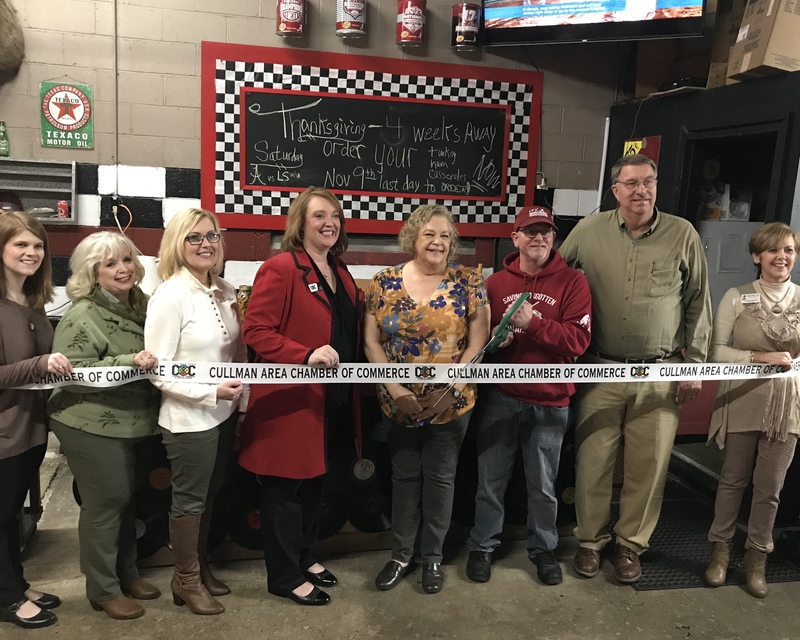 CULLMAN – It’s been open for a few months now, but on Friday, The Fillin’ Station was welcomed into the Cullman Area Chamber of Commerce with a ribbon-cutting ceremony. The Fillin’ Station is a meat-and-three deli located inside the Texaco Station at 201 Second Ave. NW (U.S. Highway 31). It’s owned by local couple Mick and Pam Whitt. The Whitts have worked hard on transforming the old service bay into charming cafe with eclectic charm. Decorated with unique items such as an old player piano, vinyl records and antiques, the bay’s greatest conversation pieces might just be the mounted moose and elk. The Whitts are active in veterans’ causes including local nonprofit Saving Forgotten Warriors and provide meals to veterans during Thanksgiving. Several features within the new dine-in area are dedicated to veterans and those who gave the ultimate sacrifice for their country. The Fillin’ Station serves breakfast daily starting at 6 a.m. The meat-and-three menu, available from 11 a.m.-2 p.m. Monday through Friday, is subject to change and offers different choices each day. Grill items are also available to order from 10 a.m.-3 p.m. Catering and take-home meals are also available. Thanksgiving orders are being taken now and must be received by Nov. 9. For the ribbon cutting, The Fillin’ Station had Mick Whitt’s famous smoked turkey salad samples available and a variety of pudding samples, including coffee, banana, piña colada and chocolate. The “Oil Bay” has a giant TV and the Whitts hope to open for the weekends once their application for beer and wine sales is approved. They hope to have the license at the beginning of the new year. To call in an order, call 256-739-6100. For a complete menu, stop by the station or visit www.facebook.com/fillinstationcullman/.